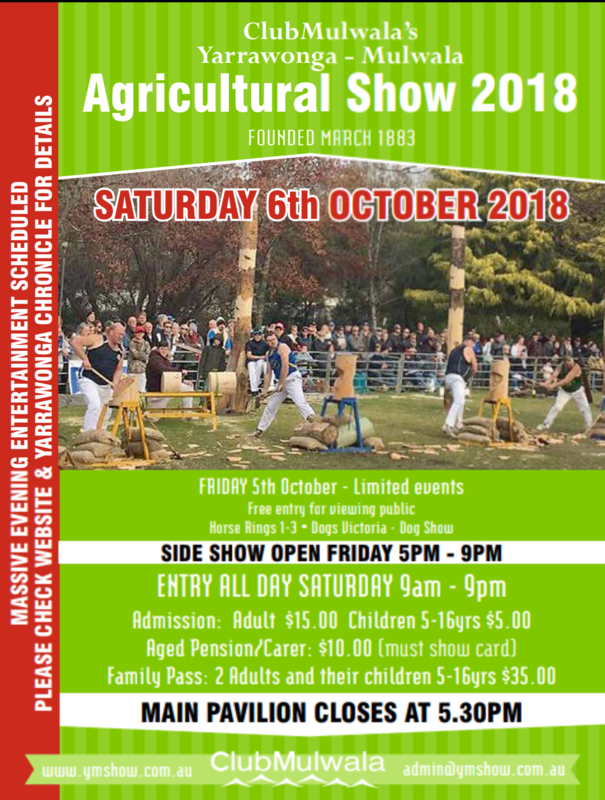 Welcome to our 2018 edition of the Yarrawonga & Mulwala Agricultural Show schedule. Our committee has again worked hard to present to the community a very exciting and interesting program for the 2018 Yarrawonga show. Our focus is to offer affordable family friendly entertainment for families and our community without the hassle of it coming at a high cost. Some of this year’s exciting entertainment will see the Wood Chop Competition return, where the best wood choppers will show off their brilliant skills with the axe. We have an amazing bubble fairy called Becky Bubble performing a magical bubble show that will wow the audience of all ages with bubbles of all shapes and sizes. The Wild Action Pack Zoo is back again and will hold shows during the day. With him he brings wildlife that would be found in our region and also some added extra creatures. The tractor Pull will kick off at 12pm with an array of vintage style tractors. The fireworks are back and proudly sponsored by Club Mulwala which will be held on the Saturday night to end our 2018 Yarrawonga Show. We will also have the pleasure of having the Royal Flying Doctors celebrating their 90th year of operation who will bring a flight simulator for the public to learn more about their amazing service they provide to the rural communities. In the main pavilion we are lucky enough to have 2 state championship Table Tennis players come and show us their skills and answer any questions you might have. They will take you through a skills session and you can watch them play a game against each other or someone from the crowd. Pop in and have a look at one of their sessions during the day. I would also like to take this time to say a few Thankyou’s, firstly I would like to give a very big thank you to Judy Cooper our former secretary for many years Judy has been a part of the show committee and dedicated a lot of her time and hard work in putting the past shows together. I wish her all the best in her future endeavours. I would also like to thank the Moira Shire, Committee of Management, Jock McDonald and the Lions Club for their generous donations to the upgrade of the main arena. 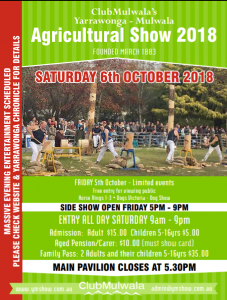 Thank you to our major sponsors Club Mulwala, without their generosity the Yarrawonga Mulwala Agricultural Show would not be able to bring such amazing entertainment to our community. I thank all our local businesses and the community sponsors for their generosity in donations and through sponsorship. Every little contribution helps make the Yarrawonga Mulwala Agricultural Show the best it can be. And lastly I want to thank each and every committee member for going above and beyond their roles and stepping up and helping get the show of the ground. Thank you again for everyone that has volunteered to help with the Yarrawonga Mulwala Agricultural Show. Please click HERE to read important information about this year’s show.